225 p., 3 ill., 14,7 x 20,8 cm. With contributions by Gerhard Fichtner, Ulrike May, Ken Robinson, Eran J. Rolnik, Erika S. Schmidt, Michael Schröter, Josef Simon, Nellie L. Thompson, W. Craig Tomlinson and Margret Tönnesmann. This volume is a collection of seven revised papers held on the subject dealt with at the 45th International Psychoanalysis Conference which took place in Berlin in 2007. These are based on the Berlin Psychoanalytic Institute, which Max Eitingon founded in 1920 and which he ran until his emigration in 1933. The Institute attracted excellent teachers (for example from Austria and Hungary) and trained people from all over the world to be psychoanalysts using an innovative training program consisting of psychoanalysis, supervision and seminars and lectures on theory. Concise individual reports convey how the psychoanalysts returning to their home countries and the many university lecturers who emigrated to the USA, England and Israel not only took these theories with them but also contributed to the institutionalization of this psychoanalytic training in their own countries. The paper attempts to survey the diverse theoretical approaches taught at the old ›Berliner Psychoanalytisches Institut‹ between 1920 and 1936 from where they were transferred to other places and countries. It distinguishes three groups of transmitters in Berlin’s psychoanalysis. The emphasis on the structural model is proposed as being typical for Berlin. Moreover, some special features of the Berlin Institute’s function and structure are pointed out, which could be of interest for the current discussion of psychoanalysis and psychoanalytic training. The paper offers a list of all teachers of the Berlin Institute and a list of all members and associate members of the ›Berliner Psychoanalytische Vereinigung‹ – after 1926 called the ›Deutsche Psychoanalytische Gesellschaft‹ – between 1920 and 1936. 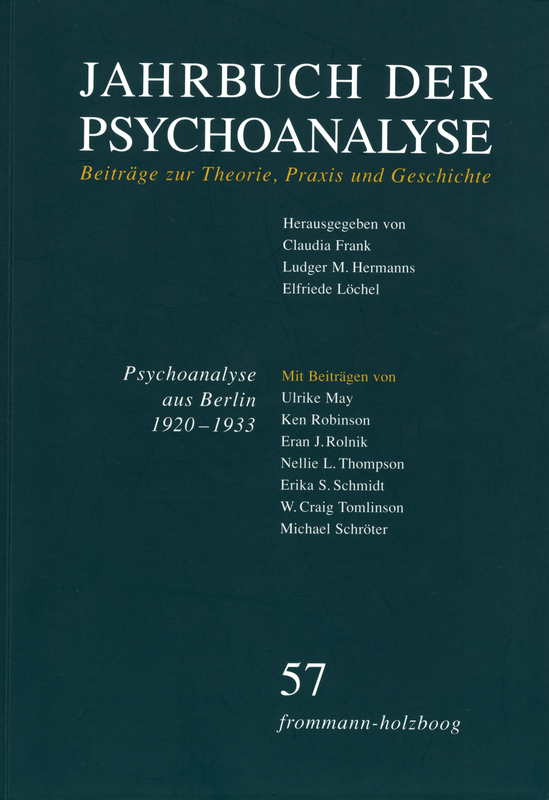 The paper explores the influence of the Berlin Psychoanalytic Society on the British Psychoanalytical Society between the two world wars. It comments on its influence in general before focussing on three analysts who had their informal »training« in Berlin and who played a central role in training in the British Society once a formal training was put in place in 1926. These analysts are Edward Glover, Sylvia Payne, and Ella Sharpe. Glover was analysed by Karl Abraham, Payne and Sharpe by Hanns Sachs. All three lectured to candidates on technique. This paper argues that they together helped to establish a British Freudian tradition, distinct from the emerging Kleinian psychoanalysis, and distinct from the Viennese tradition brought to England in 1938 with emigration of the Freuds and their Viennese colleagues. The paper examines the interplay between Eastern and Central European intellectual traditions in the establishment of psychoanalysis in Palestine / Israel. Special emphasis is laid on the role of Russian and German speaking émigrés led by Max Eitingon – Freud’s »Helmsman« (Steuermann) – in maintaining the Berlin tradition in the Jerusalem psychoanalytic institute after its establishment and during its formative years. The historical perspective developed here points out the elective affinity which early Zionists professed to find in psychoanalysis’ revolutionary nature. While juxtaposing the »New Man« of Zionist ideology and the »Freudian Man« Hebrew nation-builders developed a particular image which shaped the reception of Freud’s followers in educational, medical and scientific circles in Palestine. Hebrew culture facilitated a particular hybridization between the »Russian Freud« – to whom constructivist-collectivistic aspirations have been ascribed – and the original »German Freud« – notorious for his individualistic and pessimistic Weltanschauung. Bertram D. Lewin (1897–1971), a leading member of the New York Psychoanalytic Society and Institute, trained at the Berlin Psychoanalytic Institute in the late 1920s. His psychoanalytic education in Berlin influenced his work on the Curriculum committee that organized the New York Psychoanalytic Institute in 1931. Not only was Lewin an influential teacher, but he also wrote a number of seminal papers on dreams and sleep and authored The Psychoanalysis of Elation. Lewin’s thinking was deeply influenced by Karl Abraham and this paper delineates that influence and Lewin’s role in introducing Abraham’s ideas to American psychoanalysts. Freud considered Franz Alexander, the first graduate of the Berlin Psychoanalytic Institute and an assistant in the Berlin Polyclinic, to be »one of our strongest hopes for the future«. Alexander went on to become the first director of the Chicago Institute for Psychoanalysis in 1932, a researcher in psychosomatic medicine, a prolific writer about psychoanalysis, and prominent in psychoanalytic organizations. As he proposed modifications in psychoanalytic technique, he became a very controversial figure, especially as he elaborated his ideas about brief therapy and the corrective emotional experience. This paper puts Alexander’s achievements in historical context, draws connections between the Berlin Psychoanalytic Institute and the Chicago Institute, and suggests that, despite his quarrels with traditional psychoanalysis, Alexander’s legacy may be in his attitude toward psychoanalysis, characterized by a commitment to scientific study, a willingness to experiment, and a conviction about the role of psychoanalysis within the larger culture. This paper examines the influence of the Berlin model on psychoanalytic education in New York through the person of Sándor Radó, who was recruited from Berlin to become the first Education Director at the New York Psychoanalytic Institute in 1931, and later went on to found the Columbia University Center for Psychoanalytic Training and Research. While the basic elements of the so-called tripartite model of psychoanalytic education were adopted in principle in New York prior to Radó’s arrival, he had an enormous impact on the development and implementation of that curriculum; he also tried to enhance it theoretically and clinically and became one of the focal points of the controversies that led to the breakup of that institute. He also sought to broaden ties to American medicine and psychiatry and to research in general. This paper sketches the history of the International Training Commission. Founded in 1925 to propagate the Berlin system of psychoanalytic training with its tripartite structure and the exclusive responsibility of the Training Committee in training matters, the Commission went through several storms (lay analysis), seemed to have reached quiet waters when in 1932 IPA guidelines for training were passed, but under the constant pressure of American opposition had to resign all legislative and controlling powers in 1936, changing into a mere platform of sharing experiences, until it was finally paralysed when in 1938 American psychoanalysis declared its organizational independence of the IPA. The Berlin system of training spread all the same, but it did so by different means. In an appendix a correspondence between Franz Alexander and Max Eitingon of February/March 1938 is documented, dealing with the »Marienbad affair« and with the issue of American independence from ITC regulation. The paper traces the development of the »Independent Tradition« within the British Psychoanalytical Society as it evolved from the contributions of those psychoanalysts who following the »Controversial Discussions« during the 1940s neither wished to be aligned to the group of colleagues who adhered to Melanie Klein’s teaching nor those who adhered to Anna Freud’s contributions. They became known first as the »Middle Group«, a loose coalition who decided in 1973 to call themselves the »Independent Group«. Several contributions by »Independent Psychoanalysts« who emphasised the essential role a facilitating environment plays in early infant development and the consequences of failure in terms of the ensuing severe pathology in later life are discussed. This led to a re-appraisal of the analyst’s contribution to the clinical situation. His counter-transference was now understood as a facilitating tool in response to the patient’s communications. The question for truth – understood as a correspondence of term and matter orstatement and facts – obviously is the basic question of European philosophy. However, a statement or a sequence of signs must be sufficiently clear in order to be judged as right or wrong. Insofar as this is not or not sufficiently the case among the persons involved one raises the question for the meaning of the relevant term and the answer can again be questioned. The question for the meaning springs from non-understanding and only when the meaning or the interpretation of statements is no longer questioned it makes sense to ask for its truth. This connection was repressed in the history of philosophy by assuming a basic correspondence in respect of meaning. The article tries to show, that in the course of the historical development of philosophy the repressed meaning of meaning is increasingly part of the discussion of truth. Gerhard Fichtner: »... ein Stück kleines Emigrantenelend neben dem großen«. Ein Brief Freuds an Jeanne Lampl-de Groot aus dem Jahre 1938.